Keith Hann - Why Oh Why? : If we can't go back to mining coal, how about making our own pants? If we can't go back to mining coal, how about making our own pants? In the spring of 1974 I took a break from university and spent around six months driving a thread van. Yes, thread not bread: for J & P Coats, to be precise. My job introduced me to a world I never knew existed, of small factories beavering away turning out a wide range of garments, from ladies’ knickers to men’s pullovers. Many of them in former or then still active mining communities in Northumberland and Durham. A high proportion of those factories supplied Marks & Spencer, which used to boast until the 1990s that 98% of its goods were British made. I was one of many loyal St Michael shoppers who kept going back partly because I felt reassured that my regular purchases of underpants and cardigans were keeping the nimble fingers of seamstresses gainfully employed on my home turf. But then M&S found themselves under growing pressure from the new breed of clothing retailer that sourced its products from the cheapest sweatshops of the Far East. And, before long, I found that my Marks & Spencer underpants were coming from Sri Lanka, my suits from Mauritius and pretty much everything else from China. I would gladly have paid a bit extra to keep buying stuff made in the UK, but I was never offered that option. The irony is that this shift of production does not seem to have done Marks & Spencer much good, with the City pages reporting its “general merchandise” clothing business continuing to lurch from one disappointment to another. Meanwhile its altogether more upmarket food arm, which largely does source its products from UK manufacturers, goes from strength to strength. Those textile factories I remember from the 1970s were not, perhaps, the most exciting places to work but they provided skilled and so, I presume, reasonably paid employment. Perhaps more importantly, I do not recall any of them ever collapsing in a heap, trapping the luckless workforce in the rubble. It always seemed a little strange to me that their disappearance at the hands of “globalisation” attracted none of the publicity or angst attendant on the closure of the coalmines they operated alongside. It would be nice to think that we as consumers could exercise a little more direct power over the companies that flog us our clothes than over, say, the fuel purchasing policies of the electricity generators. 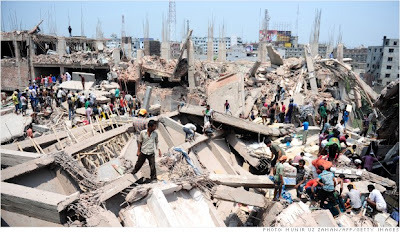 As the dead in Bangladesh continue to be totted up, I dare say that many of us will wring our hands for a day or two and tell ourselves that we really must stop buying stuff that is run up under dangerous conditions by poorly paid workers in far-off lands. Just as we reacted for a few days when a TV programme exposed the fact that our sportswear was being made by children. Then we will doubtless carry on exactly as before, because all experience suggests that, for the great British consumer, price ultimately trumps every other consideration. Those of us who are lucky enough to be able to afford to do so already do our bit to support local food producers, farmers’ markets and independent retailers wherever we can. 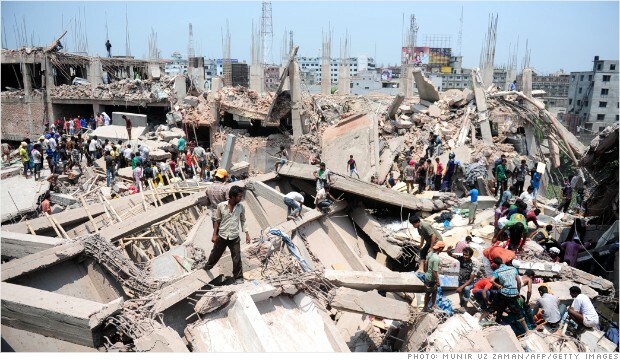 But, as I have already observed, it is extremely difficult even to try to buy locally made clothes. So this column is less of an appeal to the consumer than to the retailers, and to one retailer in particular. Have you ever thought, Marks & Spencer, of giving that old “Made in Britain” line another try? Surely it can’t be that hard to find a suitable space and some sewing machines, and I feel sure that there must be a few people in the North East who remember how it used to be done. Or am I the only man in Britain who would sit a little more comfortably if he knew that his underwear had been made in a British factory by British workers, earning a living wage?